eReader1: New for Harry Potter fans! New for Harry Potter fans! A couple of mornings ago, I received an excited text from my 16 year old daughter after a simple screenshot. That's right! JK Rowling, alongside Jack Thorne and John Tiffany, is treating is to another great tale in the life of Harry Potter. 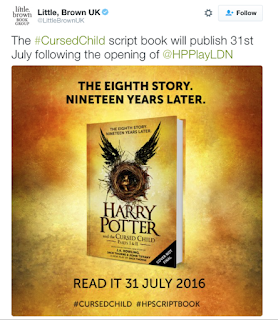 "Harry Potter and the Cursed Child" is a play that will be opening in London this summer, and those of us who won't get to fly to London to watch it can still enjoy it with the publication of the rehearsal script! It's available for pre-order and is already the number 1 bestseller in Books on Amazon! !